Heat oven to 450°F. Make pie crust as directed on box for One-Crust Baked Shell, using 9-inch tart pan with removable bottom or 9-inch glass pie plate. Bake 9 to 11 minutes or until light golden brown. Cool completely, about 30 minutes. In medium bowl, mix filling ingredients with wire whisk until well blended. Pour into cooled baked shell. 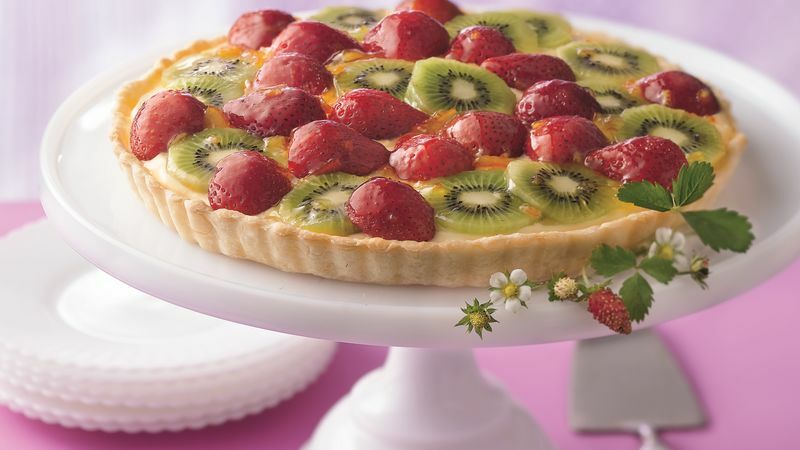 Arrange strawberries and kiwifruit on filling. In small microwavable bowl, microwave marmalade uncovered on High 5 to 10 seconds or until melted. Brush over fruit. Refrigerate about 1 hour or until set before serving. Cover and refrigerate any remaining tart. Sometimes, pie crust bubbles up when it's baked. If bubbles form, press them down gently with the back of a wooden spoon. Continue baking until the crust is done.